A single virtual non-anonymous queue across all branches and the Contact Center, enabling Customer Service Representatives (CSR's) to serve clients through Video Terminals in Branches. Traditional queuing solutions print out a ticket for specific service requests with anonymous queuing. 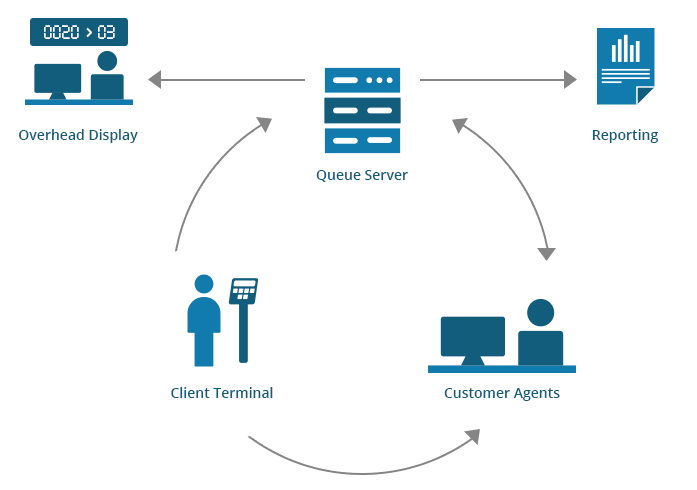 Our retail queue solution goes beyond that and provides a single virtual queue across all branches and Cisco Contact Center, allowing Customer Service Representatives (CSR's) to serve clients not only physically, but also through Video Terminals, and to do personalized queuing based on the visitor's profile. The video example here shows how queuing is done by a virtual CSR, and customers are then served in a cubicle in the background or by in-person CSR's in a dedicated booth. Queuing can however also happen with traditional ticket printers or touchscreens. When branch A is very busy, and branch B has free CSR's, then CSR's from branch B can serve clients in branch A through voice or video call. Retail Queuing uses in Cisco PCCE the UQ API of Socialminer, or Expertflow's Mediarouting for UCCX. A visitor can identify himself for queuing by using a tablet, touchscreen, browser in the branch, by entering an identification such as his account or mobile number, entering name, swiping his bank card - which will then allow more sophisticated and personalised queuing/ routing. The same effect can be achieved if customers use a mobile app for queuing. Alternatively and for non-identified customers as in a traditional approach of a printed-out ticket can used, or customers could queue with their picture that are taken by the queuing computer. The visitor queue number (or Name or picture, or last digits of a mobile or account number), as well as counter he should go to are displayed on Expertflow Wallboard, so the customer knows which counter he should visit. Additionally, estimated waiting times for new customers may be displayed. The display can either be plugged into one of the client terminals or a low-cost standalone computer can be used to feed the display. The CSR's can show their readiness for the next customer by finishing the ongoing task on their CTI client, which can be Cisco Finesse or the CRM CTI Interface. If agents use a CRM interface and if the client is identified while he is queued by entering his account/ mobile number or name, the agent will see the customer profile pop up in the CRM while the customer walks to his counter as shown in this video. Statistics and queue times are managed and consolidated centrally both for the contact center and the branches, with the possibility to do drill-downs, for example to see all interactions of a customer across all channels. © 2018 ExpertFlow - All rights reserved.